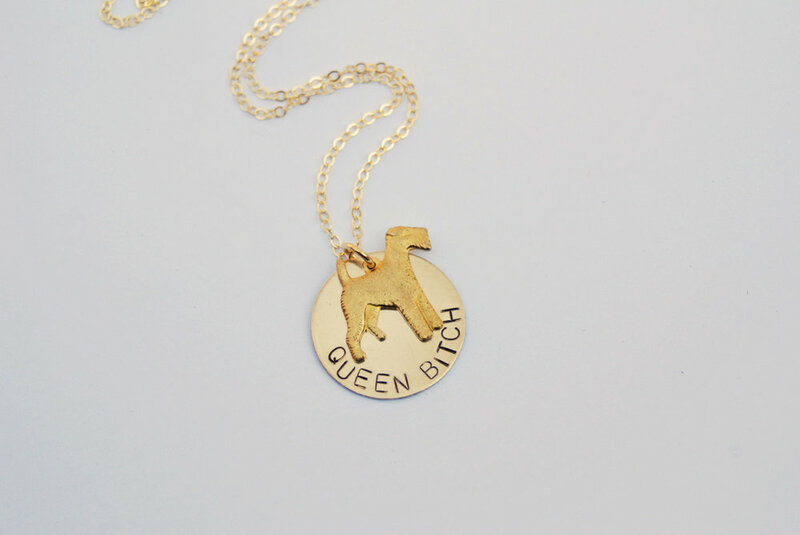 Bang-Up Betty has been stamping handmade jewelry in Arkansas since 2013. Celebrating a 5th anniversary, seeing Julianne Moore wear my jewelry and supporting great charitable causes were among some of the highlights of this Arkansas jewelry maker’s 2018. Looking back on the year, especially as all my friends are sharing their “best nine” Instagram posts, I always like to pick and choose my personal “best nine” since photo “likes” sometimes don’t do the right things justice (but are always appreciated and welcome!). 2018 was a banner year at Bang-Up Betty. I celebrated some huge milestones, saw celebrities wear my jewelry, got to raise money for several local causes that are close to my heart, and was recognized in some really amazing ways. Thank you so much to everyone who brought a piece of Bang-Up Betty handmade jewelry into their lives or gave it to a loved one this year. Thank you to everyone who came to see me at pop-up craft shows and events. Thank you to everyone who shared social media posts and told pals about my jewelry. Thank you to my stockists across the country who brought my jewelry to their cities. Every year I do this is more magical than the last. Every morning I wake up grateful and astounded at the support my home state of Arkansas has given me. Thank you, thank you, thank you again. Janelle Monae wore my I Believe in Science pin along with many other makers’ enamel pins during her Today Show performance. 1.) Janelle Monae wore my pin. The Janelle Monae. She wore my pin. My I Believe in Science enamel pin. She wore it in an assortment of feminist and activist pins on her Today Show appearance. I am still in recovery. That’s my I Believe in Science enamel pin on the right. On Janelle Monae’s outfit for her Today Show appearance. At some point in time I packaged that I Believe in Science pin with my own hands and sent it off and it landed on the lapel of THE. JANELLE. MONAE. I am breathless. Bang-Up Betty has been making artisan jewelry in Arkansas since 2013 and celebrated five years in 2018 with a pop-up in Little Rock. 2.) I had my 5th anniversary. In April of 2018 I celebrated five whole years of making jewelry in Little Rock, Arkansas, and threw a big party complete with this confetti cake that WAS NOT THE ORIGINAL CAKE I MADE. I made a unicorn-shaped cake for the occasion and Betty the cat ATE IT when I wasn’t looking the night before the party. He is a savage. Betty the cat perches in the Bang-Up Betty handmade jewelry studio. His name and personality inspired the name of the business, and he is a small internet celebrity. Follow him on Instagram at @bettyisaboy. 3.) Betty the cat made the evening news. Anytime I can get Betty the cat in a magazine or on the tv is the best time of my life. In 2018, KARK stopped by my jewelry studio and fell in love with Betty. I think he got more air time than I did and I have no complaints. Only in Arkansas: Bang-up Betty's creations are not the usual jewelry items. Arkansas bride: My gleeful expression after saying my vows (that I wrote!) at the Edgemont House in North Little Rock, Arkansas, in September. Photo by Katie Childs. 4.) I got married! This is really number one on the list BUT THE LIST IS OUT OF ORDER. Collin, don’t get mad. In September 2018, I got hitched to a very wonderful, supportive, encouraging, hilarious, handsome, incredible guy who was totally fine with us having a weird wedding. It was the most fun day of my life and we’ve been keeping the party going ever since we said “I do.” You really can’t stop the party once you buy a six-foot inflatable dancing man for your wedding and can’t return it. The inflatable dancing man at our wedding at the Edgemont House in North Little Rock, Arkansas, may have been more of a hit than the bride and groom were. Photo by Katie Childs. Read all about our wedding in this blog post I wrote about how crafty I was and how ridiculous our decor was. Julianne Moore wears a One Tough Mother Necklace by Bang-Up Betty at a Moms Demand Action conference. A portion of the proceeds from each necklace sold benefits the Arkansas chapter of Moms Demand Action. 5.) Julianne Moore wore my One Tough Mother necklace AND I raised close to $600 for this incredible charity that’s so close to my heart. I had no idea that when one of the loveliest women I know bought a One Tough Mother necklace from me, she meant to bring it to the Moms Demand Action conference and give it to Julianne Moore. Julianne Moore then wore it in a PSA for the organization that encouraged people to vote! One Tough Mother. This necklace by Bang-Up Betty benefits the Arkansas chapter of Moms Demand Action. 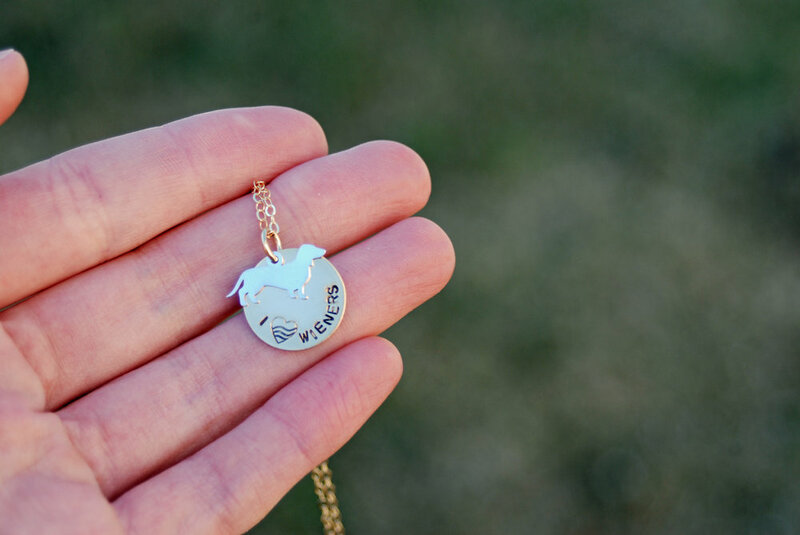 Read more about this necklace and grab one for yourself! Arkansas jewelry designer Bang-Up Betty’s “Stay Gold” collection is inspired by the Golden Girls and features vintage and limited edition pieces. Plus those big Miami colors! 6.) I made a jewelry collection inspired by The Golden Girls. I had so much fun designing this collection of vintage-inspired jewelry that my husband then photographed for me on our Lanai. Hahahaha. I’m a Dorothy at heart, but the necklace in the image above was inspired by Blanche. See more of the Stay Gold collection and read more about what inspired it here! Bang-Up Betty was voted Best Artisan for the fourth year in a row in the Arkansas Times’s Best of Arkansas for jewelry design. 7.) Y’all voted me Best Artisan in the Arkansas Times’s Best of Arkansas issue! For the fourth year in a row! I am so incredibly grateful for the support my fellow Arkansans have given me over the years. Thank you for giving me the courage to keep making jewelry and putting myself out there. You also voted my jewelry best in Arkansas Handmade Products in AY Magazine’s Best. Thank you, thank you, thank you! Bang-Up Betty jewelry was voted best in Arkansas Handmade Products by AY Magazine readers. Bang-Up Betty’s Love is Queer Bracelet 100% benefits Lucie’s Place, a shelter for homeless LGBT in Little Rock, Arkansas. 8.) I got to support Lucie’s Place by making things. Earlier this year, I dedicated this Love is Queer bracelet to Lucie’s Place, donating 100% of the profits to the nonprofit organization that provides shelter for homeless LGBT in Arkansas. I love being able to use my craft to raise money for progressive nonprofits in the state of Arkansas and across the country. My new Birthstone Cluster Collection features rough, raw and natural gemstones and is inspired by nature. Photo by Collin Buchanan. 9.) I released the Birthstone Cluster Collection, which is inspired by nature and features raw, rough-cut and natural gemstones to celebrate the wearer. Happy birthday to you! These necklaces are by far my favorite things to make right now and can be personalized. Grab your custom birthstone necklace, or maybe one celebrating your child or another loved one! Since 2013, Bang Up Betty has been serving up unique and fun handmade jewelry from Arkansas! 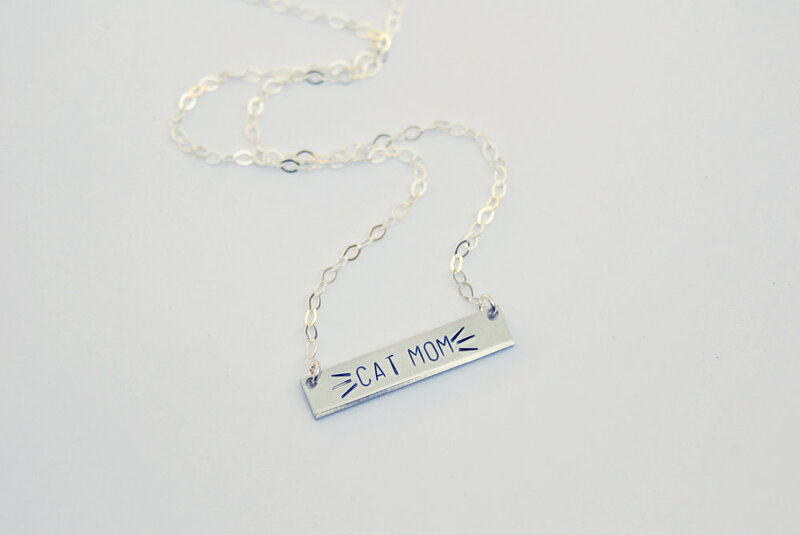 THV11 contacted me recently to chat about how I got started making jewelry, what inspires my handmade jewelry, what my bestsellers for holiday gifts are, and, of course, Betty the cat. This interview with Ashley King airs Friday, December 14, 2018, during the 8 p.m. premiere of their new show, The Vine. It’ll be an Arkansas Christmas special focusing on what’s wonderful and local, and I’m so honored they chose to showcase my handmade jewelry. I’m proud to be an Arkansas-based jeweler supporting local nonprofits and making folks laugh and smile with my jewelry! Arkansas jewelry maker Bang-Up Betty at work stamping custom jewelry at Moxy Modern Mercantile. Bang-Up Betty handmade jewelry is designed and made locally in North Little Rock, Arkansas. My brand new Birthstone Cluster Collection was inspired by nature and the gorgeously imperfect way the world’s gemstones come to us before they’re cut, set and made to look like something completely otherworldly. I cast theses stones in clear resin, letting them fall from my fingertips into the liquid wherever they land. Over several days, it hardens into a little cluster of gemstones that look like they’re bursting forth. Glowing peridots, moody sapphires, rich rubies, warm citrine crystals… all the colors of the birthstone rainbow. I'm turning 30 tomorrow, and while I know these BY FAR are not my golden years, I wanted to do something big to celebrate change, getting older and taking risks. Last year, my husband (we got married days ago, that still sounds weird) and I bought our first house. Around that time I decided I hated minimalism and obsessively watched The Golden Girls (one of those things may have influenced the other). I took a style risk and painted the solid white house mint green and coral and filled it with tropical plants and rattan furniture and embraced the pink tile in the kitchen (you’ll have to pry it from my cold, dead hands). Since I discovered Nine Inch Nails in about the 8th grade, I’ve worn almost exclusively solid dark colors. Designing a pink and green house inspired by Blanche Devereaux’s bedroom is a biiiiiiiiiiiiiiig shock to my system. Naturally, this color adventure made me realize that most of my jewelry has also been monochromatic like the rest of my style. I decided to stop denying myself the pure joy and exhilaration that I get from looking at and decorating myself in big, bright, wild colors. The Stay Gold Collection is a designer’s first immersion in color, with brass bases and stamped accents that stay true to the Bang-Up Betty style and the materials I love to work with. Below are a few highlights from the Stay Gold Collection. See the full collection here. I hope you enjoy this limited, small-batch collection featuring retro and vintage pieces. Like these warm summer nights spent on the lanai, they’ll be gone soon. 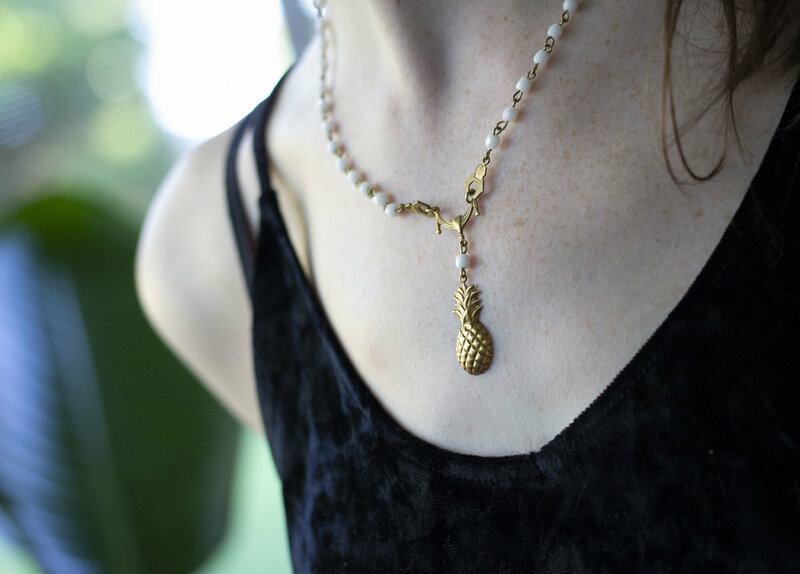 Pineapple Queen Necklace, part of Bang-Up Betty’s ‘Stay Gold’ collection of retro jewelry inspired by The Golden Girls. Special thanks to my brand-spanking-new hubby for taking these pictures on our little lanai.